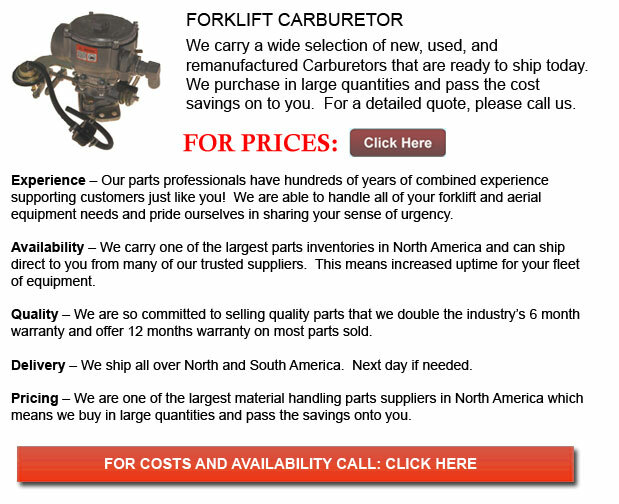 Forklift Carburetor - A carburetor blends air and fuel together for an internal combustion engine. The equipment has an open pipe called a "Pengina" or barrel, through which the air passes into the inlet manifold of the engine. The pipe narrows in section and afterward widens over again. This particular system is known as a "Venturi," it causes the airflow to increase speed in the narrowest part. Below the Venturi is a butterfly valve, which is otherwise referred to as the throttle valve. It functions so as to control the flow of air through the carburetor throat and regulates the amount of air/fuel combination the system would deliver, which in turn regulates both engine speed and power. The throttle valve is a revolving disc that can be turned end-on to the airflow so as to hardly limit the flow or rotated so that it could completely stop the flow of air. This throttle is commonly attached through a mechanical linkage of joints and rods and at times even by pneumatic link to the accelerator pedal on a car or equivalent control on other kinds of machines. Small holes are located at the narrowest part of the Venturi and at other locations where the pressure will be lessened when not running on full throttle. It is through these openings where fuel is introduced into the air stream. Specifically calibrated orifices, called jets, in the fuel path are accountable for adjusting the flow of fuel.